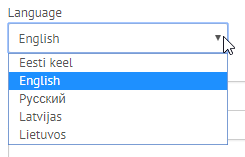 Thankfully, ShopRoller is available for use in multiple languages. As such, you might want to switch your administration language to something more comfortable for you to use. This help article is going to show you how to do that! Congratulations! You have changed your administration language. How do I add or change storefront languages? Storefront languages can be edited by clicking SETTINGS and opening LANGUAGES. We will publish a manual about this topic shortly!